Fella Goldeck is a very special hero greyhound. He is five years old and vision impaired. Earlier this year, Fella woke his owner, Penny Goldeck, at 2:30 AM by growling and running to the door, urgently asking to go out. Half asleep, Penny let him out. His mission was not to relieve himself. His mission was to foil a robbery in progress. Penny reports that the would-be thief spent the night in the jail, being taunted by inmates about getting caught by a “blind” dog. The neighbors gave Fella a stuffed elephant that he takes everywhere and the police rewarded him with a box if biscuits. Ed note: Fella was originally a foster dog. After observing a terrified Fella for a week, the Goldecks took him to a veterinarian who discovered the vision impairment. Later, because Fella was nervous and would growl when startled, the Goldecks took him to Cornell University where the examination showed the true extent of his vision problems. His condition is not progressive, but he has the eyesight of a ten year old dog. He sees fairly well during the day but only shadows at night. A severe blow to his head and steroids appears to have caused this condition. Because of Fella’s medical problems, the Goldecks decided to keep him and work with him. Fella has graduated from Beginners Obedience Class with flying colors and has worked extra-hard for a year-and-a half to become a part of the Goldeck family. 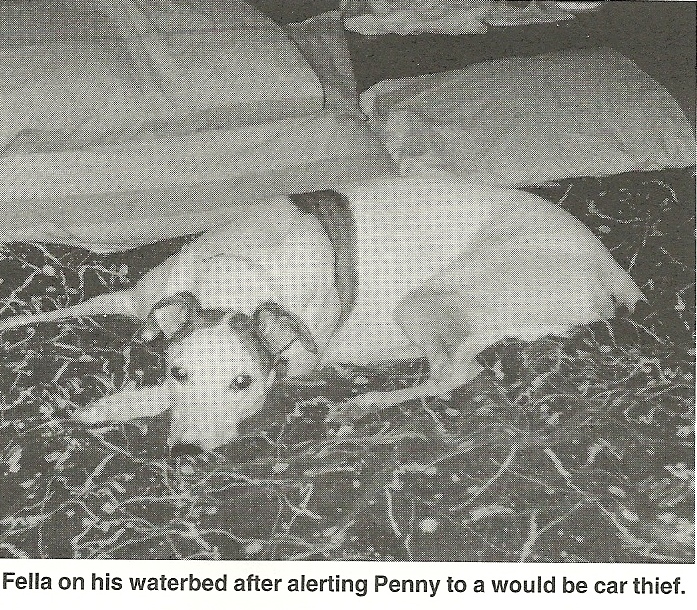 Penny Goldeck is very active with Make Peace with Animals in New Hope, PA. She lives in a trailer home in New Egypt, NJ, with her husband and other greyhounds Bossy, Cooper, Holly, and Fritz. All the greyhounds are important partners with Penny in placing other greyhounds as they teach “the ropes” to their in-house foster dogs and newly adopted dogs in other families.